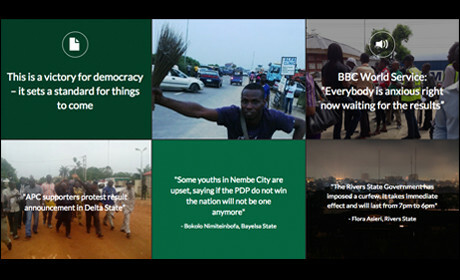 As Nigeria welcomes electing its first president from the ranks of an opposition party, a small group of citizen journalists from Africa's most populous nation can celebrate their role in reporting on proceedings – all from mobile phones. 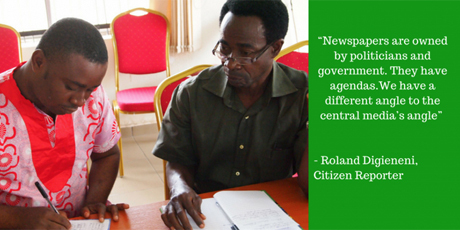 Last November, journalism trainers from self-styled 'communication rights organisation' On Our Radar travelled to the Niger Delta and trained 36 citizen journalists to report directly from their mobile devices, using a mixture of SMS and WhatsApp to submit photos, text and audio stories. "SMS and a mobile phone is almost the lowest common denominator for access for our reporters," explained Paul Myles, On Our Radar's UK-based editorial manager, "even in regions without electricity." Submitted reports go straight to Radar's "central hub", a custom-built web app that the Radar editorial team can access securely from anywhere in the world, before Myles and his colleagues connect the reporters and their stories with larger news organisations. "It's the same backend hub as we were using before the Ebola coverage," he said, referring to last summer's outbreak when citizen journalists in Sierra Leone, trained by Radar for the 2012 election, shared stories from areas the mainstream media could not – or would not – reach. "We've been getting hundreds of SMS updates on what is going on and similarly to Ebola, just under half of our reporting group have access to WhatsApp on smartphones. So using photo and audio, especially when there's a protest going on, has been an interesting way of doing some more engaging storytelling." All reports are featured on a dedicated microsite, another new addition to the Radar family that began with last year's Ebola coverage, allowing the organisation to collect all the different types of reports they receive, including the growing multimedia content from WhatsApp. "As well as the obvious text and photo functions, we have WhatsApp audio where you can record, in a quiet place, decent quality audio and it sends straight through without having to have an email address," said Myles, allowing reporters to skip the upload and attachment process and send content directly. "I'll get a call from the BBC World Service at 9 in the morning saying 'we've got this story breaking, can any of your reporters comment on it', I'll send them a message via WhatsApp and they can go and do an interview and conduct a whole interview safely using WhatsApp audio and send it over. "I can pass it back on to the BBC World Service who will then broadcast it on the radio back to Africa, 2 hours after the original contact." The journalists have two distinct aims for their coverage. "The first is more localised covering of the elections," Myles continued, "so monitoring whether things have been going smoothly, whether things have been going to plan. "They've been monitoring the situation at individual polling stations, reporting whether the atmosphere is peaceful and free from intimidation." International observers have praised the peaceful nature of this year’s election but it has not all been smooth sailing. In the southern coastal region of River State, a political stronghold of incumbent Goodluck Jonathan's People's Democratic Party (PDP), Radar trainee Eze Ahuju reported voter intimidation of opposition supporters in the lead up to election day. Elsewhere, reports surfaced through Radar of electronic card readers causing lengthy queues and worries over results being "fudged" or exaggerated, Myles said. "I guess one challenge covering elections is if you send one correspondent out they can only be in one place at one time," he added, "so we have 36 [pairs of] eyes and ears on the ground around the Niger Delta tracking what's going on." Partnerships with local media organisations have taken more prominence here than in past projects, with audio reports submitted via WhatsApp broadcast on local radio and collaborations with Sahara Reporters, the hugely popular Nigerian outlet with more than 1.5 million Facebook followers. "Around an election we feel it is more important in some contexts to get local people on the ground to read and engage with stories," said Myles. "Once on voter intimidation, in the lead up to the elections it was more important that people knew about that on the ground in Nigeria." Radar's mission has long been in giving marginalised voices an international platform and although that aim remains, there has been a greater focus on changing and diversifying the traditional narrative present in Western news media. "There's a lot of focus whenever Boko Haram do something or there's an explosion or an attack or something related to Boko Haram," continued Myles. "[The reporters] are in the Niger Delta which is a long way from the north, which is where Boko Haram are present. "So they've been challenging the narrative and saying 'well, actually, the main election issue for us is electricity', for example, 'Boko Haram feels like another country, it's a long way away and not affecting our day-to-day lives'. "Here the elections are being held peacefully and people aren't talking about Boko Haram as much as they are about electricity and youth unemployment." Indeed, last week Radar reporters featured in a Vice News story on the underlying economic issues in the country which, to many, hold more sway in how they make their decisions. But what of the upcoming UK elections? There are no specific plans in mind, said Myles, although Radar will soon start training and working with "young care leavers and young homeless people... and I'm sure they'll have election-related issues to report on". At a time when marginalised groups of society are frequently overlooked as disconnected from the political system, if not political issues, Radar's mission of giving a voice to the voiceless could prove more powerful than ever.